Guest writer Adzmandala brings the first part of his ‘Unearthed’ series on 45turns, focusing in on a selection of rare and powerful Nigerian records from the 90s. Enjoy! Politically, Nigeria in the 1990s was still under repressive military control. Despite the army stating that they would hold free and democratic elections in 1990, this wasn’t really reached until 1999. Throughout this period there was civilian unrest, people unhappy with the military junta and the lack of free and fair elections. The people of Nigeria were ready for change and this permeated through music, perhaps not in the overtly, revolutionary style of Fela Kuti but definitely through a continuation of subtle dissidence. 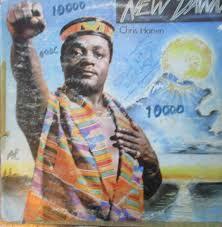 Check out Chris Hanen’s LP New Dawn released on HMV Nigeria in 1990. It features an awesome boogie stepper, ‘Ajamma’, with mellow synths bubbling in the background and positive themes throughout. Interestingly, the drums are programmed by Basil Barap, who played bass guitar on a huge swathe of classic Nigeria disco cuts of the 80s including Oby Onyioha’s LP I Want To Feel Your Love (Time Records, 1971). Next up is a great LP by Kenny Em called Shanana, released in 1990 on the small label Top Rank. It must be noted that reggae was having a huge impact on Nigeria at this time and an absolute incredible amount of reggae was being made by Nigeria artists. Some Nigerians who felt undervalued in society could identify themselves as sufferers and used music as a weapon against their oppressors. Kenny Em seems to focus his sound on this LP within deep roots territory but the tune that stands out, ‘Singing Our Own Song’ , straddles reggae, disco and boogie. It calls out for freedom and links back to the notion that most of the population are ready for change and more equality in the 90s. The third record I am focusing on is the Pretty Busy Boys with That’s The Way, released on the micro label Melodisc Feathers in 1991. It’s apparent that American soul, funk and disco had a huge impact on the Nigerian music scene prior to the 90s: obviously Nigeria had its own very distinct and personal take on this sound, and the same can be said of the 90s where popular music from America, particularly early rap, was filtered through the available channels of widespread FM radio and to some extent emerging TV channels. Although not the earliest example of Nigerian hip-hop, this record is a great example and continues with the 90s motifs of the Pollard Syndrum and Yamaha DX7. Keeping with the influence of American rap and the emergence of an early rap scene in Nigeria, we check out Hycentto Junior’s Mama Groove, originally released on Tabansi in 1991, which has just been given the reissue treatment by Loren Ipsum Records in France. The original record was pressed in very small numbers and probably didn’t reach a wide target audience outside of Nigeria. However that doesn’t diminish the fact that Hycentto Junior, originally a DJ who rapped over grooves, was a big star in Nigeria (think Grandmaster Flash meets Biz Markie via Nigeria!). The beats and synth lines are incredible on this LP and that’s testament to the production by the legendary Nkono Teles. Turn it up! Lastly is a record from the wants list – A record from 1995 by GP. Fruitjuice called On Top. Sound strange? It is. Released privately on the label Atlanta, it fuses elements of boogie and hip hop to melt into some kind of wild proto house weirdness. It’s so compelling and I wouldn’t mind a copy, just so I could play the track Robust Buttocks loud in the club…. keep digging. Adzmandala is based in Newcastle Upon Tyne and runs an Afrocentric club night and radio show called Cosmifrica. Find out more at the Cosmifrica facebook page. For more solid Nigerian gems, check out our three-piece introduction to the Music of West Africa.